We are the leading manufacturer, supplier and exporter of Pipe Earthing inIndia. These are manufactured with state of the art technology and high grade raw material to provide unmatched quality. These are highly popular among our valued client's due to durability and price. We are manufacturing finest Conventional Pipe Earthing as per IS 3043. In Conventonal Pipe, Earthing, Pipe is embedded Vertically in ground to work as Earth Electrode. We also supply Earthing Charcoal and salt and other material required in Pipe Earthing. We also maunfacture customized pipe earthing as per customer's drawing/specification. We are manufacturing finest GI Earthing Electrode as per IS 3043. We provide this earthing electrode to our clients in different specification at competitive rates. The offered electrodes are made in tune with the industry standards for meeting the variegated demands of clients. The technical specification of our conventional GI Pipe Earthing, 40 mm dia (GI Pipe - Medium/Heavy), duly perforated with suitable GI Clamp and funnel. Earthing Pipe should accompany with Earthing Charcoal and Salt and FRP/CI Earthing Pit Cover, complete set. We are manufacturing finest CI Earthing Electrode as per IS 3043. We provide this earthing electrode to our clients in different specifications at competitive prices. The technical specification of Jey Tee Conventional CI Pipe Earthing Electrode have 100 mm dia, 13 mm thickness and 3 meter long with suitable Clamp and Funnel . The Earthing Pipe should accompany with Earthing Charcoal And Salt and with CI/ FRP Earthing Pit Cover, complete set. 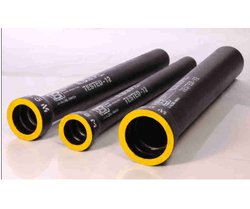 Cast Iron Pipe Earthing Electrode is used for earthing of All Heavy Machinery And Is Best Choice Of Earthing For Power Stations, Transmissions, Railways, NLC, ICF, Industrial Companies. We are manufacturing Finest GI Perforated Pipe, which are used in earthing. The offered pipe is manufactured under the supervision of our skilled professional using the finest quality raw material and cutting edge technology in sync with set industry standards..